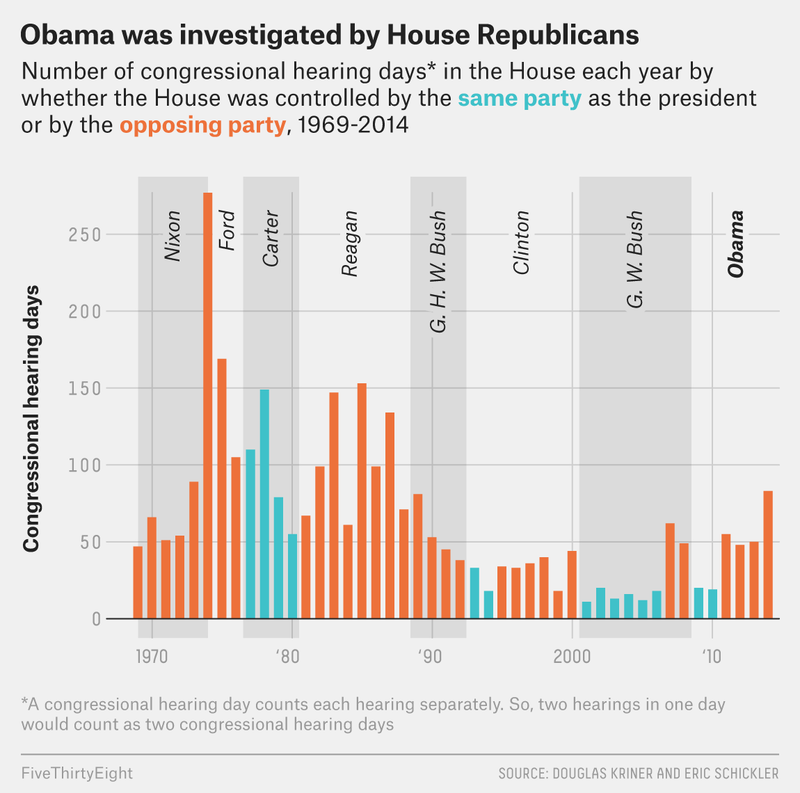 During the Republican administration of George W. Bush, the number of days spent on hearings related to executive misconduct shot up when Democrats took control of the House in 2007 and began a wide range of investigations against Bush. Investigations spiked again after Republicans won back the House in 2010 and launched a series of investigations into the Obama administration, which led to some political messes for Obama. And the House GOP’s yearslong probe of the 2012 attack on the U.S. diplomatic mission in Benghazi, Libya, also ended up shaping views about Hillary Clinton in ways that may have damaged her politically, not least by unearthing the existence of a private email server that dogged her throughout her 2016 presidential campaign. Whether this pattern is a good thing is another question. The same partisan motivations that spur Democrats and Republicans to amp up their investigations when the opposing party controls the White House could also lead them to ignore or downplay issues that are ripe for investigation when the president is also a member of their party. But Obama, George W. Bush and Bill Clinton all emerged from at least one midterm election in which their party lost the House and they ended up facing a new barrage of investigations. So even though Trump may feel that Democrats’ investigations are unfair, his situation is not unique. To distinguish between investigations of executive branch misconduct and routine oversight, Kriner and Schickler searched the Congressional Information Service database to isolate hearings that involved the executive branch and then coded the hearings as part of an investigation only if they included allegations of abuse or misconduct.